KAMPALA – The Archdiocese of Gulu, chosen by the Uganda Episcopal Conference to animate the 2019 Uganda Martyrs Day Celebrations is seeking for UGX. 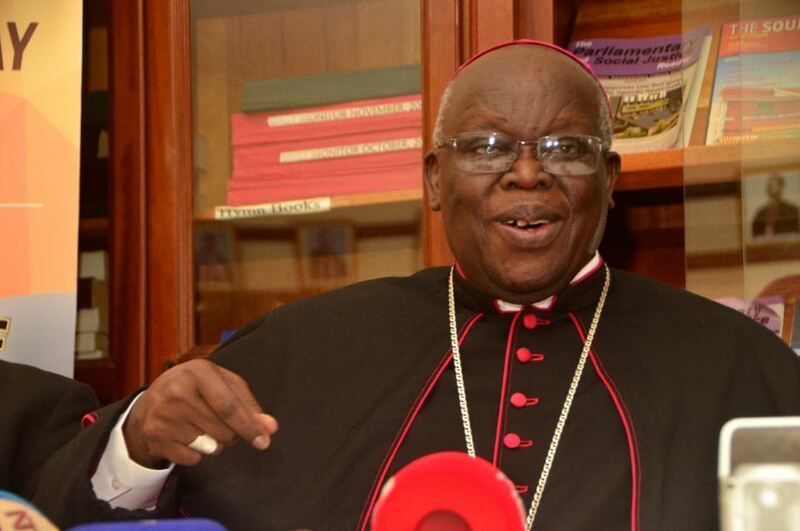 900 million to fund the preparations, Archbishop John Baptist Odama said on Thursday. The Most Rev. Odama said the money is needed to fund activities for a successful preparation including liturgical activities, health readiness, accommodation and transport, communication and publicity among others. “I invite all of you here present, our listeners and viewers to support this fundraising drive generously,” he said. “We have opened a bank account with CENTENARY BANK, Gulu Main Branch and the following are the account details: A/C NAME: ARCHDIOCESE OF GULU NAMUGONGO MARTYRS CELEBRATIONS: ACCOUNT NUMBER: 3100059093”. The Archbishop has been in Kampala all weekend to launch awareness activities for the preparations of the Uganda Martyrs Day Celebrations 2019. The activities kicked off with volleyball, netball and football games between Mbarara Archdiocese and Gulu Archdiocese on Saturday, before a Holy Mass on Sunday at Kitante Primary School, where the Mbarara community raised Shs 30 million towards the 2019 Martyrs Day Celebrations. Archbishop Odama thanked the Mbarara Archdiocese community for the great gesture of supporting Gulu for the success of this year’s Uganda Martyrs Day. “They told me that Gulu’s success is Mbarara’s success, what a generous attitude? I thank them sincerely and request all the other dioceses to learn from Mbarara,” Archbishop Odama said. 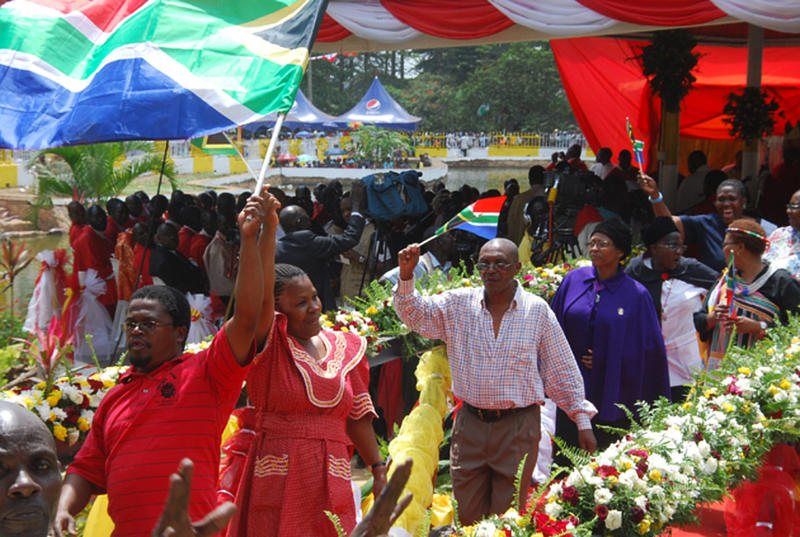 He announced that the theme for this year’s celebrations will be: “Obey God Always and Everywhere (based on Acts.4:19), as a rallying call to all pilgrims who annually come to honour the Uganda Martyrs and indeed all mankind, to come back to God and be loyal to Him. He said the Archdiocese of Gulu will use the opportunity of leading the celebrations for the Uganda Martyrs Day this to celebrate the martyrdom of the two Acholi Martyrs Said I Okelo and Jildo Irwa, at national and international level. “In addition to the twenty-two Martyrs, we also have the two Catechists, Blessed Daudi Okelo and Jildo Irwa from Paimol in the Archdiocese of Gulu. They were killed in 1918 and beatified in 2002 by Saint Pope John Paul II. Last year was therefore the 100th anniversary of their Martyrdom, celebrated at the local level at the Wi Polo Paimol Martyrs Shrine in Kalongo Catholic Parish, Agago District. This Centenary will be commemorated at the National level this year on 3rd June,” he said. I have the honour to officially announce that the Archdiocese of Gulu was chosen by the Uganda Episcopal Conference in June 2018 to organize and animate the 2019 Uganda Martyrs day celebrations at the Namugongo Catholic Shrine. The celebrations are usually organized on a rotational basis according to the four ecclesiastical provinces of the Catholic Church in Uganda. The Archdiocese is, therefore, organizing on behalf of the Gulu Ecclesiastical Province which consists of the dioceses of Arua, Gulu, Lira and Nebbi. The Archdiocese of Gulu last animated the celebrations at Namugongo in 2003 soon after the beatification of Blessed Daudi Okelo and Jildo Irwa in 2002 at the Vatican. The two Blessed Martyrs symbolically joined the twenty-two Martyrs of Uganda when their relics were brought to Namugongo after their beatification. The Catholic Church honours the Uganda Martyrs, Saint Charles Lwanga and Companions on 3rd June. In Uganda, the day is observed as a Solemnity and we have the unique honour to receive millions of pilgrims from all over the world, who come to pay homage to both the Catholic and Anglican Martyrs. These heroes of our faith were killed between 1885 and 1887 for converting to Christianity. The execution was sanctioned by Kabaka Mwanga II, the then king of Buganda. The twenty-two Catholic Martyrs were beatified on 6th June 1920 by Pope Benedict XV and canonized on 18th October 1964 by Saint Pope Paul VI. In addition to the twenty-two Martyrs, we also have the two Catechists, Blessed Daudi Okelo and Jildo Irwa from Paimol in the Archdiocese of Gulu. They were killed in 1918 and beatified in 2002 by Saint Pope John Paul II. Last year was, therefore, the 100th anniversary of their Martyrdom, celebrated at the local level at the Wi Polo Paimol Martyrs Shrine in Kalongo Catholic Parish, Agago District. This Centenary will be commemorated at the National level this year on 3rd June. This celebration is indeed an opportunity for the Archdiocese of Gulu as a family, together with the faithful in Uganda and the Universal Church, to learn from the Martyrs’ faithfulness and obedience to Jesus Christ (Matthew 24:13), and to seek their intercession. It is a moment of spiritual renewal as we strive to preach the gospel and fight the evils in our society today. The theme guiding our celebrations this year is, “OBEY GOD ALWAYS AND EVERYWHERE”. I was inspired by the words of the Blessed Apostles to the Sanhedrin, which had ordered them to stop speaking in the name of Christ. They answered, with Peter and John as their spokesmen, “Judge for yourselves whether it is right in God’s sight to listen to you rather than God” (Acts 4:19). Loyalty to God is a priority to every believer in God. We plan to organize retreats, recollections and novena prayers to assist the people to reflect more deeply on the celebration theme and on the life of the Uganda Martyrs. A prayer has been composed to enable our Christians to pray for the success of the celebration and for personal spiritual renewal and growth. This prayer is already being recited in all the parishes and Religious Houses in the Archdiocese of Gulu. We request all the Catholic radios in Uganda to recite this prayer on a daily basis so that their listeners can be part of the spiritual preparations for the celebration. We also encourage all Christians in Uganda and beyond to prepare spiritually for this great day. Together with the Uganda Episcopal Conference, we have constituted a Central Organizing Committee and ten (10) sub-committees. The Secretary-General of Uganda Episcopal Conference, Msgr. John Baptist Kauta is the overall Coordinator and Msgr. Matthew Odong, the Vicar General of the Archdiocese of Gulu is the Chairman of the Central Organizing Committee. The following are the sub-committees: i) Finance; ii) Liturgy/Pastoral; iii) Publicity and Information; iv) Construction, Decoration and Sitting; v) Pilgrims; vi) Protocol and Security; vii) Accommodation; viii) Transport; ix) Catering and Welfare; x) Health. The total budget for the Uganda Martyrs celebration this year is UGX 900,000,000/= (Nine hundred million Uganda shillings only). This money will cater for all the preparation activities and the actual celebration. On 30th December 2018, we officially commissioned members of the Central Organizing Committee (COC) and launched the fundraising drive for the Uganda Martyrs day celebration 2019, at St Joseph Cathedral in Gulu. Today, Monday, 25th February 2019, we are holding this Press Conference here at the Uganda Catholic Secretariat in Kampala, as part of the national launch for sensitization and fundraising. A special Website and WhatsApp groups have been established for publicity and mobilization. The Publicity Committee has made a program to visit all the parishes and institutions in the Archdiocese of Gulu to sensitize and mobilize the community so that they can fully participate in the preparations and celebration. There is an ongoing Choir training for members drawn from all the parishes of the Archdiocese of Gulu. A fundraising sports event took place in Kampala on Saturday, 23rd February 2019. It included Football, Volleyball and Netball matches between the Archdiocese of Gulu and the Archdiocese of Mbarara Development Association (AMDA). The Pre-Namugongo Fundraising Walk has been planned for March 2019. Fundraising dinners will be held in Gulu and Kampala in March and April 2019. Contributions are expected from the parishes, institutions and the Catholic families in the Archdiocese of Gulu as well as from well-wishers living outside the Archdiocese. Gold, Silver and Bronze certificates will be designed and awarded to Individuals who will make substantial contributions towards the celebrations. Appeals will be made to the various the Church and Government institutions, business entities, corporate bodies and Ugandans in Diaspora. An official souvenir magazine will be produced with paid adverts from institutions, companies, corporate bodies and individuals. I invite all of you here present, our listeners and viewers to support this fundraising drive generously. 1) The Central Organizing Committee. 2) The Priests, Religious, Parish Councilors, Catechists, Headteachers and Heads of Catholic institutions in the Archdiocese of Gulu. 3) The sons and daughters of the Archdiocese of Gulu residing beyond our boundaries. 4) The Uganda Episcopal Conference team. 5) The members of the Archdiocese of Mbarara Development Association (AMDA). 6) Our Christians and all people of good will who have made contributions. May the Almighty God bless our preparations and celebration, and may He continue to shower His blessings upon us through the intercession of our Mother Mary, St. Joseph our Patron, Blessed Daudi Okelo and Jildo Irwa, and all the Martyrs of Uganda. ALMIGHTY GOD, YOU ARE OUR CREATOR, SUSTAINER, JUDGE AND REDEEMER. HELP US WITH YOUR GRACE, TO OBEY YOU ALWAYS AND EVERYWHERE, SO AS TO LIVE IN LOVE, UNITY AND PEACE, AS JESUS, BLESSED VIRGIN MARY, ST. JOSEPH, UGANDA MARTYRS AND ALL THE SAINTS DID. WE MAKE THIS PRAYER THROUGH CHRIST OUR LORD. AMEN. Given at the Uganda Catholic Secretariat, Nsambya, Kampala on Monday, 25th February 2019.